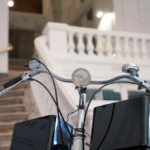 Finding Song Home is a sonic bike opera made for Brussels by Kaffe Matthews and the Bicrophonic Research Institute (BRI). The Sonic Bikes stay available in Brussels. It is a work that explores the injustices of birthright and the power of nations governments to enable or prevent the free movement of its citizens. Through meeting and sharing with often illegal non-European Brussels immigrants, Matthews has gathered a mass of their stories which, intimately told through the voices of the tellers, create a multi-threaded libretto to be revealed by audience cycling the GPS linked sonic bikes through and beyond Brussels centre. The routes the opera takes pass between La Monnaie, the canal border and Molenbeek squares, re-defining these areas as sonic cyclists can pedal through, songs and narratives recontextualized as they unfurl through the shifting street’s soundscape and Matthews electronic counterparts. With sounds triggered by where and how fast the bike goes, so each participating cyclist can define their own experience. The Sonic Bikes can be taken out at Q-O2 on reservation (info@q-o2.be) or at La Monnaie MMtickets, Rue des Princes 14, 1000 Bruxelles, Tuesday – Friday 12:00 – 17:00 / Saturday 11:00 – 17:00. Info tickets@lamonnaie.be / +32 (0)2 229 12 11. There are 6 adult bikes and two for children.